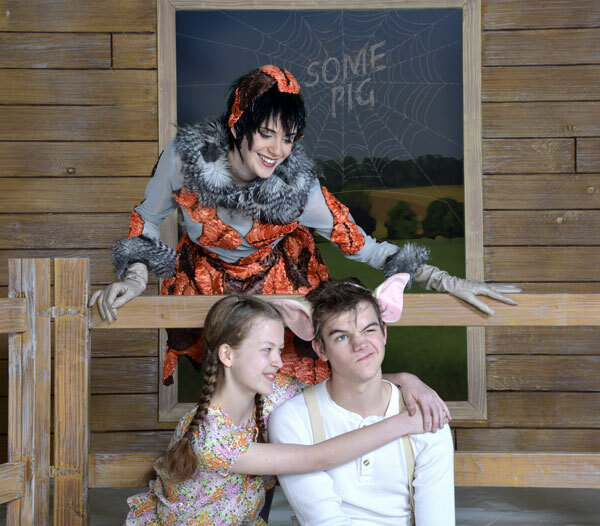 Discover the true meaning of friendship and life’s everyday miracles as Dallas Children’s Theater (DCT) presents Charlotte’s Web April 25 – June 1. You’ll make friends all over again with Fern and Avery, and all the charming barnyard characters that you remember in this beloved tale. DCT jumped at the opportunity to revive one of its most popular titles and introduce a whole new generation to E.B. White’s profoundly touching novel. This all-new production will be directed by DCT Associate Artistic Director, Artie Olaisen. “Charlotte’s Web remains one of the most cherished stories of modern literature,” he says. “It continues to be at the top of every audience and educator survey we do, and deservedly so for its gentle affirmation of the joys of life.” Generations of readers have fallen head over heels in love with Wilbur the pig and his wise arachnid friend, Charlotte, and DCT hopes to give young playgoers the opportunity to do the same. When a young girl named Fern rescues the runt of a litter of pigs, she adopts him as her own and affectionately names him Wilbur. When Wilbur grows too big, he must be moved to the neighboring Zuckerman farm. A benevolent barn spider, Charlotte A. Cavatica, living in the space above his stall, comes to the rescue when speculation amongst the talking animals is that Wilbur won’t be around long. Charlotte launches a campaign to prevent Wilbur from becoming bacon and uses her unique web-spinning talents to write words about Wilbur in her web. People come from miles around to view “the miracle” in the web and the extraordinary pig. With Charlotte’s help, aided by Templeton, the irascible rat, Wilbur wins a special prize at the County Fair, thus sparing his life. One of the first books ever written for children exploring issues of mortality, Charlotte’s Web is an emotional tribute to friendship with universal themes depicting courage, compassion and the ever-changing cycle of life. Monique Abry, who recently made her DCT debut in “’Twas the Night Before Christmas”, plays the clever and loyal Charlotte. Assuming the role of the sensitive, affectionate and famous Wilbur is up-and-coming young singer-actor, Johnny Lee. Popular local actor Andy Baldwin returns to DCT with his unique comic flair to play the gluttonous Templeton, the rat. The large ensemble of youth and adult actors also include DFW favorites such as M. Denise Lee, Deborah Brown, Brad Jackson, Karl Schaeffer, Emily Ford, and Randy Pearlman. The role of Fern will be alternately performed by Ingrid Fease and Cate Stuart. It’s the best-loved children’s story of all time and winner of The Newbery Honor Medal! Enjoyed by ages 5 and up. To purchase your tickets, visit www.dct.org or call their box office at 214-740-0051. Attend the final dress rehearsal on Thursday, April 24 at 7:30 pm and pay-what-you-can! A suggested donation is $10 per person. Attend the show on Friday, April 25 for extra fun one hour prior to the show. Try your hand at County Fair games such as bean bag toss, hat ring toss and oversized tic tac toe. Giveaways, free treats from Nothing Bundt Cakes at intermission, and one free show poster per family! You’re invited to SOME PARTY on Saturday, April 26 starting at 1:30 pm at DCT’s Rosewood Center. Watch the show followed by food, fun, crafts, show-related activities, and much more. Play in the petting zoo, take photos in the barnyard, talk to Wilbur and Charlotte, and learn how to be a gardener. Show tickets range from $17 – $26 and party tickets are $30 per person. Seating is limited so make your reservation today by calling 214-978-0110 ext. 174.